Comments: A copy that has been read, but remains in excellent condition. Pages are intact and are not marred by notes or highlighting. The spine remains undamaged. There are no stickers on book or rips in dust cover. CD ROM UNOPENED. 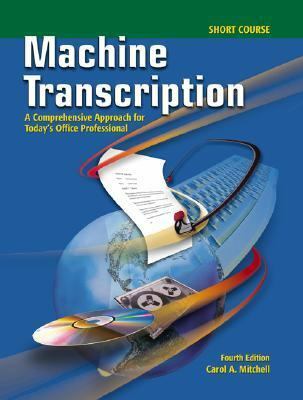 Part 1: Orientation to Machine Transcription Section 1You a Machine Transcriptionist Section 2Machine Transcription-On the Job Section 3Transcribing Techniques Section 4Effective Listening Section 5Dictation Part 2: Transcription Lessons Part 3: AppendixMitchell, Carol A. is the author of 'Machine Transcription A Comprehensive Approach for Today's Office Professional Short Course Student Text', published 2001 under ISBN 9780078228322 and ISBN 0078228328. Loading marketplace prices 6 copies from $1.80 How does the rental process work?